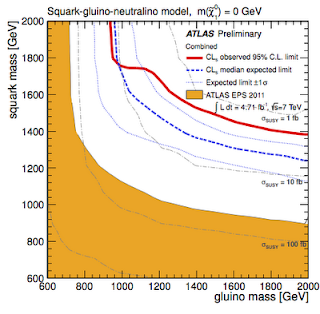 It shows the parameter space of a simplified SUSY models where the only particles are 1st and 2nd generation squarks, a gluino and a massless neutralino. If the squarks are outside of the LHC reach the lower limit on the gluino mass is now above 900 GeV, whereas if the squarks and gluino have comparable masses the limits on both are approaching the impressive value of 1.5 TeV. ATLAS has been lucky with the background and therefore in most of the parameter space the limits are somewhat better than expected (in spite of an excess in one category with 4 jets). One can see that we're running out of the parameter space, as the plot legend barely fits the allowed region. ATLAS also prepared 5 fb-1 updates of multijet and 1 lepton + jets SUSY searches. Those are less sensitive in a generic case, but for some specific SUSY spectra they could provide more stringent limits than the vanilla jets+MET search. No excess in either. 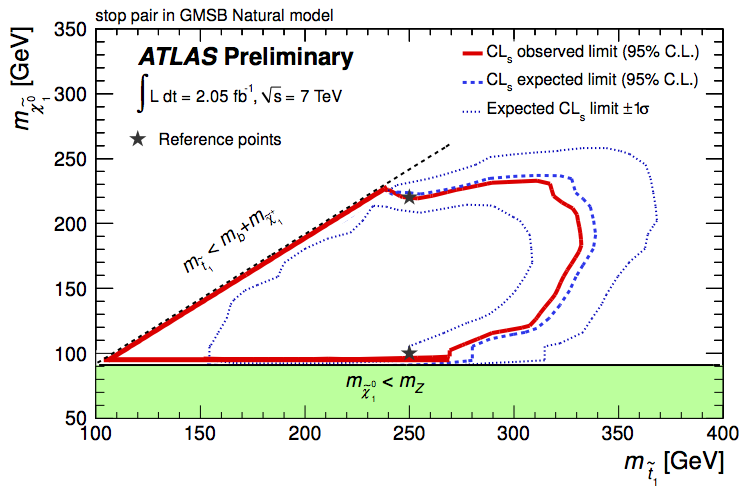 Re "But, more generally, there are no model independent limits yet". Yes, but how many falsifiable predictions does "Completely-unconstrained-SUSY" actually make? Yeah, model-independent is not the best word here, there will never be fully model independent limits. My point is rather that no limits exist for a fairly reasonable scenario: light stops, sbottoms and neutralinos, everything else heavy. Until that arrives, we cannot be 100% sure that SUSY cannot address the naturalness problem. Great post Jester, as usual. Keep up with the good job! Cheers. I'm wondering whether my recollection is right, that tan beta should be roughly 1-3 or 30-50, and recent searches have it set at 10? Generally, in the MSSM there is no theoretical reason for tanbeta to take any particular value. 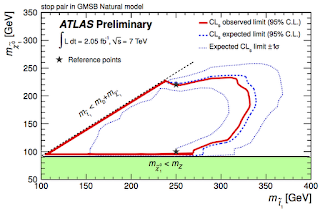 Phenomenologically, for small tanbeta it's difficult to pump up the Higgs mass up to 125 GeV, while for large tanbeta flavor constraints are stronger. So tanbeta~10 is simply the safest choice.